Public Reporting | William Blackburn Consulting, Ltd. In May I had the opportunity to participate in the annual conference of the Global Reporting Initiative (GRI) in Amsterdam and at the meeting of the Working Group of ISO 26000 Social Responsibility (SR) Guideline Standard in Copenhagen (Paul Hohnen and I are GRI’s co-delegates). From these two meetings, it is apparent that important changes are underway in the area of sustainability and SR. The International Organization on Standardization (ISO) has issued over 17,500 standards since its founding more than 60 years ago. Some are relatively unknown and rarely used, but others have had a major impact. For example, nearly 1 million facilities have been certified under the ISO 9001 quality management system standard and approximately 200,000 under the environmental counterpart, ISO 14001. The fact that an influential standards-setting body like ISO invested in a large, five-year, global multistakeholder process for SR is in itself a testament that SR has arrived at the forefront of organizational management. Emerging from this process was general consensus about what stakeholders expect socially responsible organizations to do–or rather a re-affirmation of what has been captured in a collection of other declarations and tools–and how such organizations might implement SR. While ISO’s guidance on implementation may not add much to those already familiar with management systems, the text on SR core subjects, issues and principles is a major step forward in defining what SR means operationally. Now, if an organization says it aspires to be socially responsible, that organization and its stakeholders know what specific obligations that may entail. Unfortunately, the standard does not explain how the GRI Sustainability Reporting Guidelines (www.globalreporting.org) , the UN Global Compact (www.unglobalcompact.org) and other important tools already in use in the field may be used together with ISO 26000 to achieve social responsibility—a gap in the standard which GRI and the UNGC are now attempting to fill (see below). Even so, ISO 26000 nevertheless provides a useful framework that is compatible with such tools and opens the door to their use. During the meeting, the ISO delegation moved the draft standard along at an intense pace with many late night negotiations. Because of the pressure to finally resolve issues in the text that have lingered for years and the “negotiation by exhaustion” needed to do that, some sections remain conceptually rough (stakeholder concept, prioritization factors for SR issues, etc.). Overall, however, the standard seems passable and blazes a new path for ISO and social responsibility. Eventually the group adopted a resolution sending the new draft to be edited into a Final Draft ISO Standard (FDIS) by the end of this month. The FDIS will then be distributed for delegation vote Aug 1-Sept 30, and if accepted, published as final in December. For the standard to be accepted, more that 2/3 of the national standards body delegations must vote in favor of it and not more than 25% against it. The vote on the previous stage, going from the DIS to the FDIS, was 79% yes and 23% no. Given that the document was improved somewhat to address concerns and in view of the oral support expressed for the resolution on the draft, the standard is expected to be approved. But there will opponents– likely India and China and a few other developing nations, some industry delegates, and the governments of the US and Canada (on the precautionary approach issue). Sexual Orientation: Over a half dozen Middle Eastern countries, some new to the working group, said they had instructions from home to oppose the standard if it continued to advocate non-discrimination on the basis of sexual orientation. A last-minute compromise was reached that involved substituting the term “personal relationships” for the offending term. Common but differentiating responsibility, trade barriers, and international norms: All of these points were slightly different ways for China and India to object to the various human rights and other social responsibility obligations spelled out in the standard. The assumption was that these countries want to pick and choose among these obligations to fit local views and practices. The rest of the working group wasn’t persuaded. Philanthropy in SR: The NGOs from France and a few other Western European countries objected to a proposed clause indicating that philanthropy can be an “important element” in SR, claiming that often it is contrary to SR and merely a way for a company to “pay off” the community for the harm that it does. Compromise language was found. Precautionary Principle: This principle as explained in the draft says that lack of full certainty about the severity of the threat of serious or irreversible damage to the environment or human health cannot justify inaction on such threat. The Canadian and U.S. governments expressed their sustained opposition to this text and especially on the extension of the principle beyond the environmental field to human health. Sphere of Influence: At industry’s insistence, the note was maintained in the definition of “sphere of influence” that says, “The ability to influence does not, in itself, mean there is a responsibility to exercise that influence.” This reflects the view of John Ruggie, special representative on Human Rights to the UN Secretary General, which a number of NGOs reject. This statement is as far as an organization can go in suggesting the standard was used by them. No certification against the standard will be allowed, although it is not clear how ISO will rein in rouge consultants who breach that prohibition. 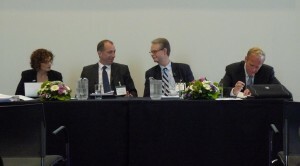 A panel on ISO 26000 and the GRI Guidelines chaired by Leeora Black (left) heard presentations by (left to right) Kevin McKinley (Deputy Secretary-General, ISO), Bill Blackburn (GRI expert adviser) and Jonathon Hanks (Incite Sustainability and chair of ISO drafting team). GRI Annual Conference, Amsterdam, May 27. Fair Operating Practices Society: Corruption, Public Policy, Anti-competitive Behavior, etc. Economic: Economic Performance, Market Performance, etc. ISO 26000 also says that “an organization should…report about its performance on social responsibility to affected stakeholders” and adds that many do this periodically. And while it mentions the use of indicators, it does not provide any but rather directs organizations to other sources, such as GRI. It discusses general communications around SR and briefly mentions the characteristics that such communication should possess, but again leaves the detailed guidance on that to others like GRI (see Table 2). A more complete comparison between GRI and ISO 26000 is provided in the April 2010 Discussion Draft: GRI-ISO 26000 DIS Linkage Document issued by GRI. Click here to review the document. Comments on the linkage document are encouraged and can be made following the instructions in the document. The document will be finalized when the final ISO standard issues. One interesting and yet unanswered question is, to what extent have the respective global multistakeholder processes of ISO 26000 and GRI defined and distinguished the operational scope of social responsibility and sustainability, respectively. As Table 1 shows, there is only one significant difference between the scopes of these two concepts: ISO’s social responsibility excludes, and GRI’s sustainability includes, the economic viability of the organization itself. The similarity should be no surprise because in setting the scope, ISO looked to a host of important intergovernmental declarations and nongovernmental tools, including GRI itself. It intentionally carved out financial viability and performance because, as stated at one of its earlier meetings, that was already well regulated. It remains to be seen, however, whether the ISO consensus on the scope of SR will prevail over that embedded in “CSR” reporting, which often touches on an organization’s financial performance as well. In any event, the link between an organization’s financial performance and its performance on social and environmental issues will strengthen as the push for integrated (ESG + financial) reporting progresses, as further discussed below. ISO 26000 also identifies in considerable detail the main social and environmental obligations drawn from key instruments of the United Nations, International Labour Organization and other multi-governmental bodies, expanding upon the key ones summarily captured in the UN Global Compact. Like GRI, the Global Compact has prepared its own draft linkage document to explain the connection. ISO says that “an organization should set its direction by making social responsibility an integral part of its policies…” indicating one way an organization can do this is through a “vision statement.” As with indicators, ISO provides no model vision statement itself but leaves it to other sources, such as the Global Compact, to help fill this void. A few companies, such as Novo Nordisk, United Technologies Corporation, American Electric Power, Natura, BASF, Anglo Platinum and Phillips, have already issued integrated reports with varying degrees of success. The challenge is to succinctly insert environmental and social information that is material (significant) to both investors and other stakeholders as well. Just tacking a traditional 100-page CSR/sustainability report onto a traditional financial report won’t do. Drafters have to be more selective about content. Because the investor community will have a stronger interest in such reports than in a usual CSR/sustainability report, the ESG content must accommodate that shift in readership. The report should explain the strategic importance of this nonfinancial information to the success of the company. This includes identifying the important risks and opportunities posed by ESG factors and how the company is addressing them. To accommodate the ESG audience, the impact of financial considerations on social and environmental factors should be covered too. For example, is the company tending to cut corners on safety and environmental protections in order to meet cost savings and production targets a la BP? One important consequence of integrated reporting will be an increased scrutiny of the quality of ESG data being communicated by companies. ESG information is flooding the market now, via individual CSR/sustainability reports as well as through users like Bloomberg and Thomson Reuters who are inserting company GRI disclosures into their new data services. Unfortunately, company data collection systems and quality controls behind the ESG information are often weak. With the advent of integrated reporting, new auditing standards will no doubt come and new auditing teams and methodologies developed to assure that reported data is accurate and reliable and that the issues material to the company and its stakeholders are identified and discussed. Financial expertise alone will no longer suffice. This change will happen for several reasons. For one, the regulatory and stock exchange requirements for financial reporting will spill over onto the ESG disclosures being included in such reports. For another, mandatory standards like King III and voluntary guidance like the CERES Roadmap for Sustainability (www.ceres.org) will place growing pressure on companies to assign oversight and accountability for such reports to specific committees of the board of directors. This change will have important consequences for company sustainability professionals. Accordingly, they should be looking ahead and discussing this with their CFOs, Comptrollers, Corporate Secretaries and financial auditing leaders. GRI indicated it will not venture into detailed carbon reporting but will continue to call for basic data already identified in its G3 indicators and sector supplements. The investor-driven Carbon Disclosure Project, the mandatory European carbon trading rules, and the new US EPA carbon reporting regulations, among other schemes, are already developing the detailed approaches that can produce the data described by GRI. For highlights on some of these reporting requirements, click here.